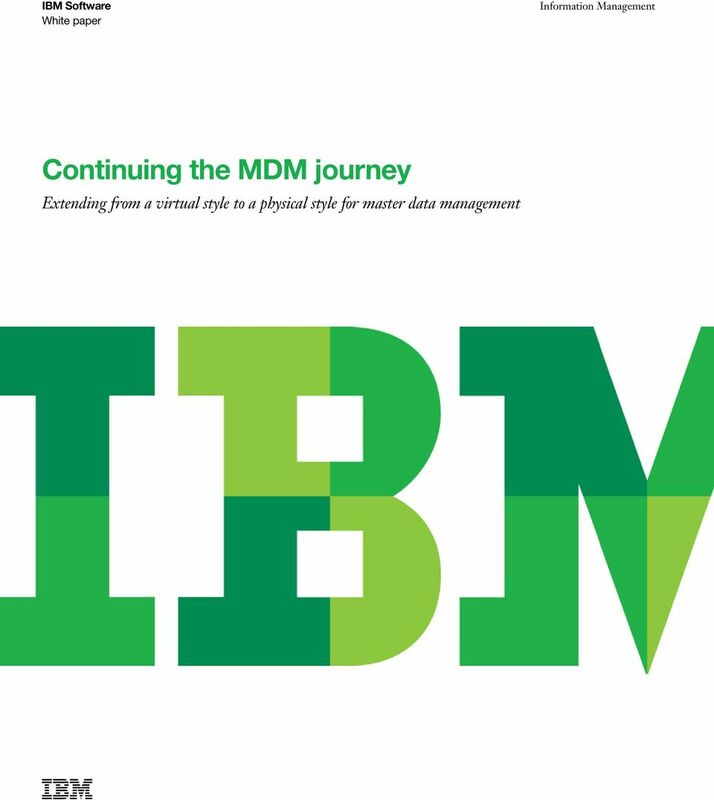 Download "Continuing the MDM journey"
2 2 Continuing the MDM journey Organizations implement master data management (MDM) solutions to streamline the creation, management, use and analysis of critical information about customers, accounts, products, employees and more. An effective MDM solution can meet an organization s business needs in both the short and long term. 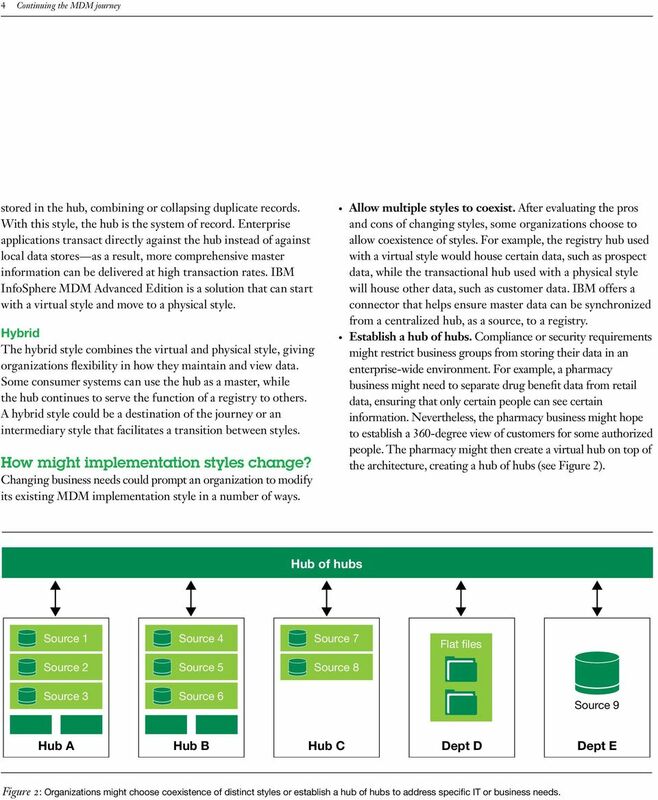 Yet for many organizations, the need to incorporate data from new source or consuming systems, add new data domains or solve new business problems might lead them on an MDM journey in which they alter their existing MDM implementation or move from one type of MDM architecture or implementation style to another. This paper focuses on the move from a virtual (or registry ) architectural style to a physical (or transactional ) architectural style, which can be accomplished within IBM InfoSphere Master Data Management (MDM). 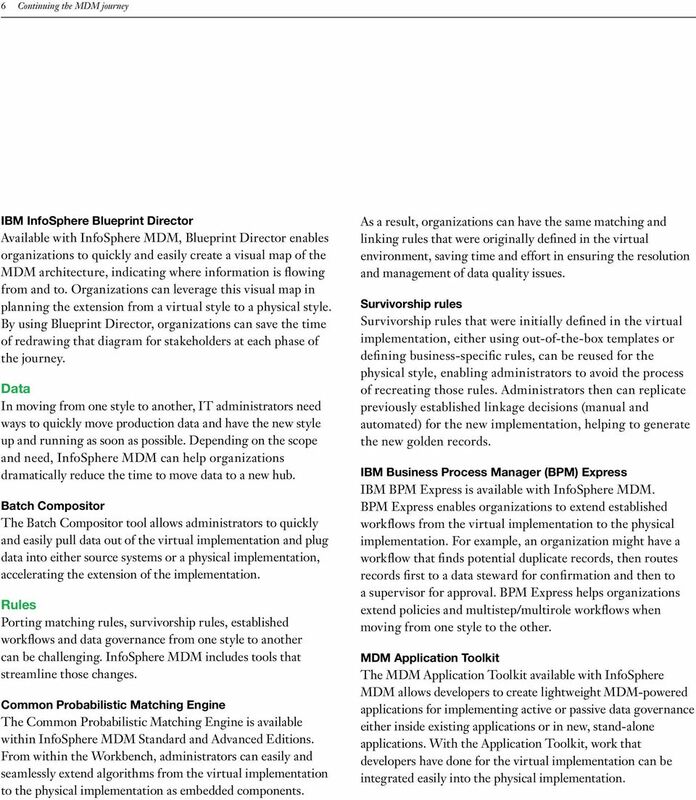 While moving from one style to another can appear to be a daunting task, IBM InfoSphere MDM features deep matching, application development and workflow integration capabilities that can help simplify this change. IBM offers the tools, expertise and experience to help organizations address a range of potential challenges as they move from one style to another. What is an MDM journey? 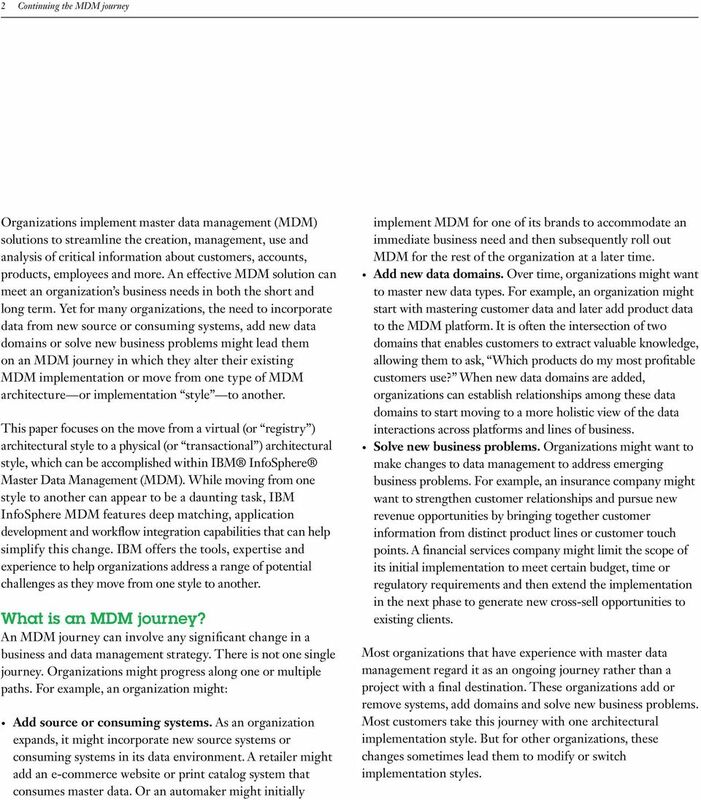 An MDM journey can involve any significant change in a business and data management strategy. There is not one single journey. Organizations might progress along one or multiple paths. For example, an organization might: Add source or consuming systems. As an organization expands, it might incorporate new source systems or consuming systems in its data environment. A retailer might add an e-commerce website or print catalog system that consumes master data. Or an automaker might initially implement MDM for one of its brands to accommodate an immediate business need and then subsequently roll out MDM for the rest of the organization at a later time. Add new data domains. Over time, organizations might want to master new data types. For example, an organization might start with mastering customer data and later add product data to the MDM platform. It is often the intersection of two domains that enables customers to extract valuable knowledge, allowing them to ask, Which products do my most profitable customers use? When new data domains are added, organizations can establish relationships among these data domains to start moving to a more holistic view of the data interactions across platforms and lines of business. Solve new business problems. Organizations might want to make changes to data management to address emerging business problems. For example, an insurance company might want to strengthen customer relationships and pursue new revenue opportunities by bringing together customer information from distinct product lines or customer touch points. A financial services company might limit the scope of its initial implementation to meet certain budget, time or regulatory requirements and then extend the implementation in the next phase to generate new cross-sell opportunities to existing clients. Most organizations that have experience with master data management regard it as an ongoing journey rather than a project with a final destination. These organizations add or remove systems, add domains and solve new business problems. Most customers take this journey with one architectural implementation style. But for other organizations, these changes sometimes lead them to modify or switch implementation styles. 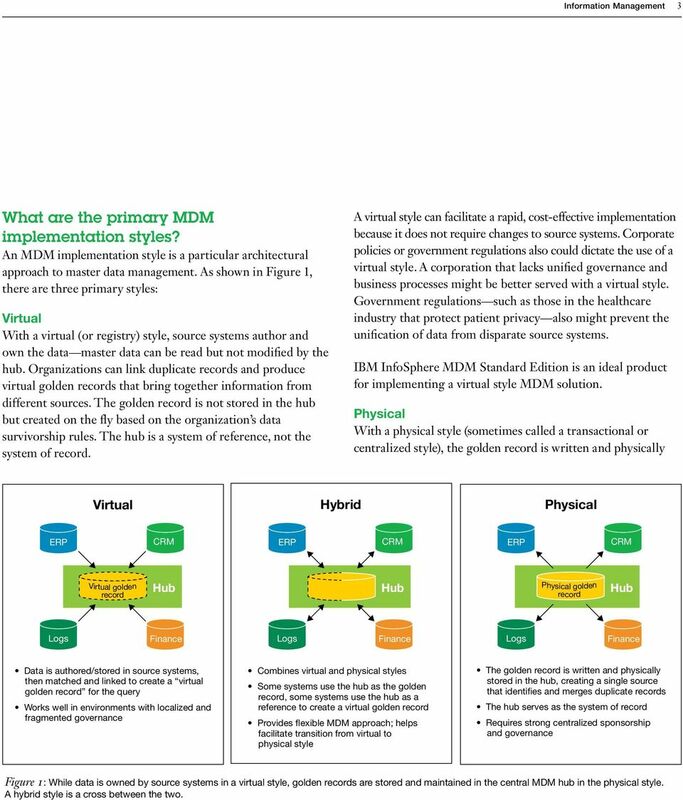 3 Information Management 3 What are the primary MDM implementation styles? An MDM implementation style is a particular architectural approach to master data management. As shown in Figure 1, there are three primary styles: Virtual With a virtual (or registry) style, source systems author and own the data master data can be read but not modified by the hub. Organizations can link duplicate records and produce virtual golden records that bring together information from different sources. The golden record is not stored in the hub but created on the fly based on the organization s data survivorship rules. The hub is a system of reference, not the system of record. A virtual style can facilitate a rapid, cost-effective implementation because it does not require changes to source systems. Corporate policies or government regulations also could dictate the use of a virtual style. A corporation that lacks unified governance and business processes might be better served with a virtual style. Government regulations such as those in the healthcare industry that protect patient privacy also might prevent the unification of data from disparate source systems. 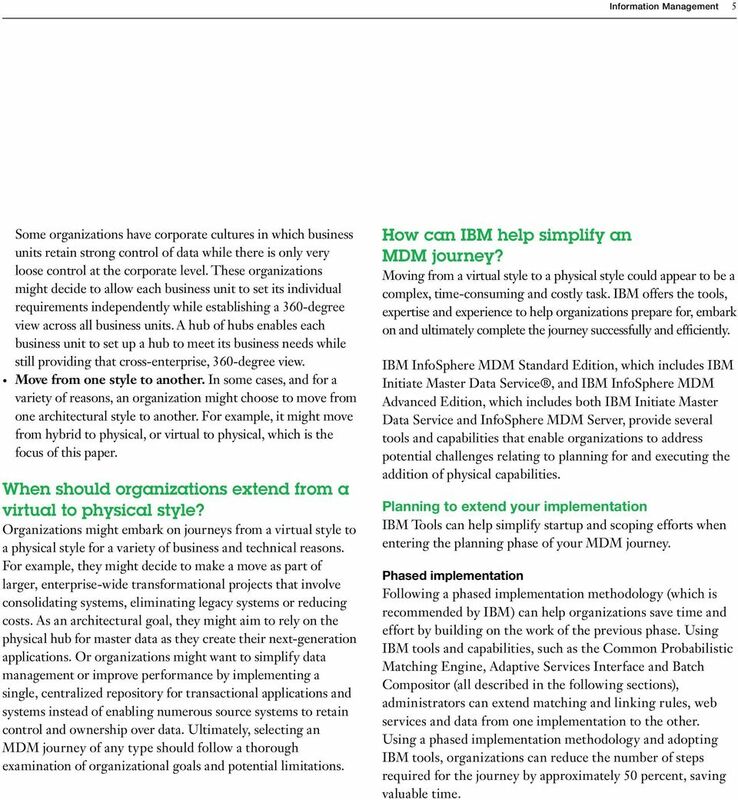 IBM InfoSphere MDM Standard Edition is an ideal product for implementing a virtual style MDM solution. Physical With a physical style (sometimes called a transactional or centralized style), the golden record is written and physically Virtual Hybrid Physical ERP CRM ERP CRM ERP CRM Virtual golden record Hub Hub Physical golden record Hub Logs Finance Logs Finance Logs Finance Data is authored/stored in source systems, then matched and linked to create a virtual golden record for the query Works well in environments with localized and fragmented governance Combines virtual and physical styles Some systems use the hub as the golden record, some systems use the hub as a reference to create a virtual golden record Provides flexible MDM approach; helps facilitate transition from virtual to physical style The golden record is written and physically stored in the hub, creating a single source that identifies and merges duplicate records The hub serves as the system of record Requires strong centralized sponsorship and governance Figure 1: While data is owned by source systems in a virtual style, golden records are stored and maintained in the central MDM hub in the physical style. A hybrid style is a cross between the two. 4 4 Continuing the MDM journey stored in the hub, combining or collapsing duplicate records. With this style, the hub is the system of record. Enterprise applications transact directly against the hub instead of against local data stores as a result, more comprehensive master information can be delivered at high transaction rates. IBM InfoSphere MDM Advanced Edition is a solution that can start with a virtual style and move to a physical style. Hybrid The hybrid style combines the virtual and physical style, giving organizations flexibility in how they maintain and view data. Some consumer systems can use the hub as a master, while the hub continues to serve the function of a registry to others. A hybrid style could be a destination of the journey or an intermediary style that facilitates a transition between styles. How might implementation styles change? Changing business needs could prompt an organization to modify its existing MDM implementation style in a number of ways. Allow multiple styles to coexist. After evaluating the pros and cons of changing styles, some organizations choose to allow coexistence of styles. For example, the registry hub used with a virtual style would house certain data, such as prospect data, while the transactional hub used with a physical style will house other data, such as customer data. IBM offers a connector that helps ensure master data can be synchronized from a centralized hub, as a source, to a registry. Establish a hub of hubs. Compliance or security requirements might restrict business groups from storing their data in an enterprise-wide environment. For example, a pharmacy business might need to separate drug benefit data from retail data, ensuring that only certain people can see certain information. Nevertheless, the pharmacy business might hope to establish a 360-degree view of customers for some authorized people. The pharmacy might then create a virtual hub on top of the architecture, creating a hub of hubs (see Figure 2). Hub of hubs Source 1 Source 4 Source 7 Flat files Source 2 Source 5 Source 8 Source 3 Source 6 Source 9 Hub A Hub B Hub C Dept D Dept E Figure 2: Organizations might choose coexistence of distinct styles or establish a hub of hubs to address specific IT or business needs. 5 Information Management 5 Some organizations have corporate cultures in which business units retain strong control of data while there is only very loose control at the corporate level. These organizations might decide to allow each business unit to set its individual requirements independently while establishing a 360-degree view across all business units. A hub of hubs enables each business unit to set up a hub to meet its business needs while still providing that cross-enterprise, 360-degree view. Move from one style to another. In some cases, and for a variety of reasons, an organization might choose to move from one architectural style to another. For example, it might move from hybrid to physical, or virtual to physical, which is the focus of this paper. When should organizations extend from a virtual to physical style? Organizations might embark on journeys from a virtual style to a physical style for a variety of business and technical reasons. For example, they might decide to make a move as part of larger, enterprise-wide transformational projects that involve consolidating systems, eliminating legacy systems or reducing costs. As an architectural goal, they might aim to rely on the physical hub for master data as they create their next-generation applications. Or organizations might want to simplify data management or improve performance by implementing a single, centralized repository for transactional applications and systems instead of enabling numerous source systems to retain control and ownership over data. Ultimately, selecting an MDM journey of any type should follow a thorough examination of organizational goals and potential limitations. 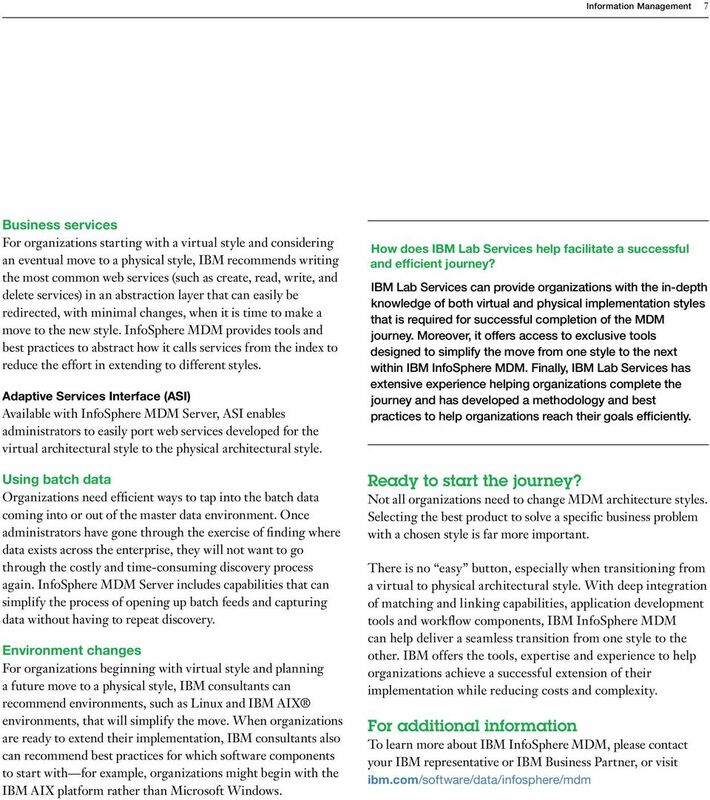 How can IBM help simplify an MDM journey? Moving from a virtual style to a physical style could appear to be a complex, time-consuming and costly task. IBM offers the tools, expertise and experience to help organizations prepare for, embark on and ultimately complete the journey successfully and efficiently. IBM InfoSphere MDM Standard Edition, which includes IBM Initiate Master Data Service, and IBM InfoSphere MDM Advanced Edition, which includes both IBM Initiate Master Data Service and InfoSphere MDM Server, provide several tools and capabilities that enable organizations to address potential challenges relating to planning for and executing the addition of physical capabilities. Planning to extend your implementation IBM Tools can help simplify startup and scoping efforts when entering the planning phase of your MDM journey. Phased implementation Following a phased implementation methodology (which is recommended by IBM) can help organizations save time and effort by building on the work of the previous phase. Using IBM tools and capabilities, such as the Common Probabilistic Matching Engine, Adaptive Services Interface and Batch Compositor (all described in the following sections), administrators can extend matching and linking rules, web services and data from one implementation to the other. Using a phased implementation methodology and adopting IBM tools, organizations can reduce the number of steps required for the journey by approximately 50 percent, saving valuable time. 6 6 Continuing the MDM journey IBM InfoSphere Blueprint Director Available with InfoSphere MDM, Blueprint Director enables organizations to quickly and easily create a visual map of the MDM architecture, indicating where information is flowing from and to. Organizations can leverage this visual map in planning the extension from a virtual style to a physical style. By using Blueprint Director, organizations can save the time of redrawing that diagram for stakeholders at each phase of the journey. Data In moving from one style to another, IT administrators need ways to quickly move production data and have the new style up and running as soon as possible. Depending on the scope and need, InfoSphere MDM can help organizations dramatically reduce the time to move data to a new hub. Batch Compositor The Batch Compositor tool allows administrators to quickly and easily pull data out of the virtual implementation and plug data into either source systems or a physical implementation, accelerating the extension of the implementation. Rules Porting matching rules, survivorship rules, established workflows and data governance from one style to another can be challenging. InfoSphere MDM includes tools that streamline those changes. Common Probabilistic Matching Engine The Common Probabilistic Matching Engine is available within InfoSphere MDM Standard and Advanced Editions. From within the Workbench, administrators can easily and seamlessly extend algorithms from the virtual implementation to the physical implementation as embedded components. As a result, organizations can have the same matching and linking rules that were originally defined in the virtual environment, saving time and effort in ensuring the resolution and management of data quality issues. Survivorship rules Survivorship rules that were initially defined in the virtual implementation, either using out-of-the-box templates or defining business-specific rules, can be reused for the physical style, enabling administrators to avoid the process of recreating those rules. Administrators then can replicate previously established linkage decisions (manual and automated) for the new implementation, helping to generate the new golden records. IBM Business Process Manager (BPM) Express IBM BPM Express is available with InfoSphere MDM. BPM Express enables organizations to extend established workflows from the virtual implementation to the physical implementation. For example, an organization might have a workflow that finds potential duplicate records, then routes records first to a data steward for confirmation and then to a supervisor for approval. BPM Express helps organizations extend policies and multistep/multirole workflows when moving from one style to the other. MDM Application Toolkit The MDM Application Toolkit available with InfoSphere MDM allows developers to create lightweight MDM-powered applications for implementing active or passive data governance either inside existing applications or in new, stand-alone applications. With the Application Toolkit, work that developers have done for the virtual implementation can be integrated easily into the physical implementation. Creating an Integrated, Optimized, and Secure Enterprise Data Platform: IBM PureData System for Transactions with SafeNet s ProtectDB and DataSecure Table of contents 1. Data, Data, Everywhere... 3 2.